Introduction: Extracted human teeth have been used commonly in dental institutions to train students acquire the skills to perform on live patients. No disinfectant mentioned in the literature as 100% effective is completely safe. Although there are studies on the effectiveness of disinfectants, assessment of knowledge, attitude and practice regarding the handling of extracted teeth among dental students are rare. Aims: The aim was to assess the knowledge, attitude and practice regarding handling of extracted teeth among the students of a dental college in Bhopal. Materials and Methods: A self-designed, close-ended questionnaire containing 16 questions was distributed to 500 students including the undergraduates and postgraduate students of a dental college in Bhopal. The questionnaire comprised 5 questions on knowledge, 5 on attitude and 6 on the practice towards handling of extracted human teeth. The responses were coded and entered in Microsoft excel and analyzed using SPSS 14. Mann-Whitney U-test was used to compare the mean knowledge, attitude and practice scores across genders. Statistical significance of mean knowledge, attitude and practice scores across year of study was assessed using Kruskal-Wallis test. Results: Of the 500 questionnaires distributed, 412 were returned with a response rate of 82.4%. The total mean knowledge, attitude and practice scores were 1.25 ± 1.12, 5.00 ± 1.12 and 4.89 ± 0.96 respectively. Comparison of mean knowledge, attitude and practice scores between genders was not significant. The difference in mean attitude and practice scores across year of study were statistically significant. Conclusions: Instructions regarding handling of extracted teeth need to be given to students when they enter the BDS curriculum. It's always safe to follow the guidelines issued by the Center for Disease Control while handling extracted teeth. Dental students practice their preclinical skills on artificial tooth models, typhodont teeth, extracted teeth etc., to learn numerous dental procedures. Whereas, artificial models and teeth pose no hazard, many of the dental procedures are best learnt on extracted human teeth, as these best simulate the clinical situations. Extracted human teeth have been used commonly in dental institutions to train students acquire the skills to perform on live patients. , This is being followed since a long time. Since the students procure extracted teeth from various sources-private dental clinics, oral surgery clinics, hospitals etc., the teeth need to be stored and preserved for a considerable amount of time, before they are actually put into use. If the teeth are not stored in a liquid medium, they become brittle and unsuitable for use. Various solutions have been used to store and transport extracted teeth. Of all the media, most common ones are formalin, saline, hydrogen peroxide and sodium hypochlorite. Since these liquids are easily available in dental clinics, they have become the obvious choice to store extracted teeth. No disinfectant mentioned in the literature as 100% effective is completely safe. There is a trade-off to using the disinfectant media with all the limitations. While there are studies on the effectiveness of disinfectants, assessment of knowledge, attitude and practice regarding the handling of extracted teeth among dental students are rare. Hence, this study was conceived with the intention to assess the knowledge, attitude and practice regarding handling of extracted teeth among the students of a dental college in Bhopal. Participants of the study were students of People's College of Dental Sciences and Research Centre, Bhopal. Convenient sampling was used to include all students of the college from 1 st year BDS to PG students. Ethical approval to conduct the study was obtained from Institutional Ethical Committee of the college. Participation in the study was voluntary. The participants were informed about the aim of the study and those who were willing to sign a written informed consent, participated in the study. No incentives were given to the participants. A self-designed close-ended questionnaire containing 16 questions was distributed among 500 students including the undergraduates and postgraduate students. 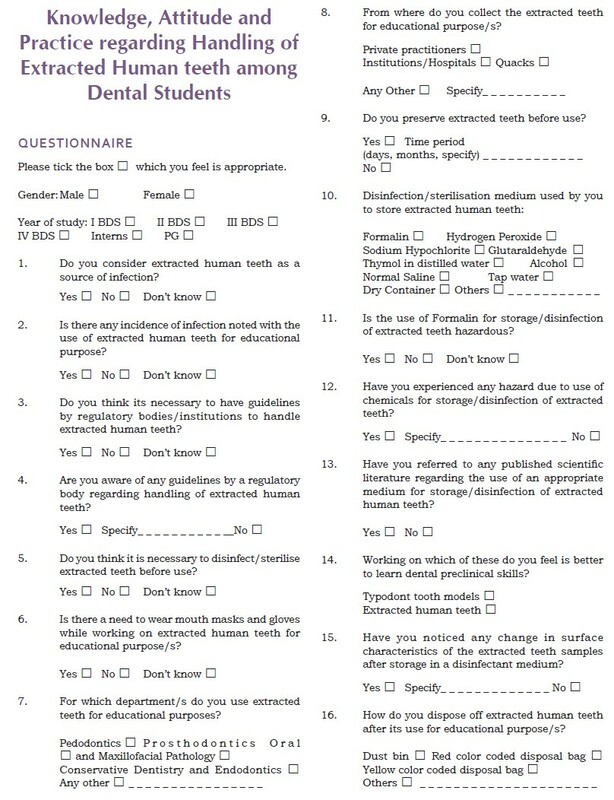 The questionnaire comprised five questions on knowledge (questions 2, 4, 11, 13, 16), five questions on attitude (questions 1, 3, 5, 6, 14) and six questions on practice (questions 7-10, 12, 15) towards handling of extracted human teeth. The questionnaire was prepared in English and was validated by test-retest method by administering it to ten students. Reliability was assessed by split-half reliability coefficient test (ρ = 0.83, good reliability). The responses were coded and entered in Microsoft excel and analyzed using SPSS 14 (SPSS Inc. 223, South Wacker Drive, 11 th Floor, Chicago II, 60606-6412). Mann-Whitney U-test was used to compare the mean knowledge, attitude and practice scores across genders. Statistical significance of mean knowledge, attitude and practice scores across year of study was assessed using Kruskal-Wallis test. Significance level was set at P < 0.05. Out of the 500 questionnaires distributed, 412 were returned with a response rate of 82.4%. [Table 1] shows the sociodemographic distribution of the study sample. Most of the study participants (>70%) were students from III BDS, IV BDS and interns. 74% of the students were females. The responses of the participants to the questions have been presented in [Table 2]. Most of the students (74.5%) considered extracted teeth to be a source of infection. About 35% of the participants reported incidence of infection noted with the use of extracted human teeth. Guidelines by regulatory bodies/institutions to handle extracted human teeth were necessary according to 84.7% of the respondents. Though extracted human teeth are commonly used in dental institutions, it was noted that 80.6% of the subjects in the present study were not aware of any guidelines by a regulatory body regarding handling of extracted human teeth. The vast majority (90.0%) answered that extracted teeth need to be sterilized before use. About 91.7% of them also felt that mouth masks were necessary while working on extracted teeth. Most of the students (77.2%) used the extracted teeth for preclinical exercises in the Department of Conservative and Endodontics, followed by Pedodontics (50.5%) and Prosthodonics (28.9%). About 66.5% of the participants collected the extracted teeth from institutions/hospitals, while 51.2% from private practitioners and others from quacks. Most of the study subjects (73.8%) preserved extracted teeth in some form before use. The most common period mentioned was for 30 days. 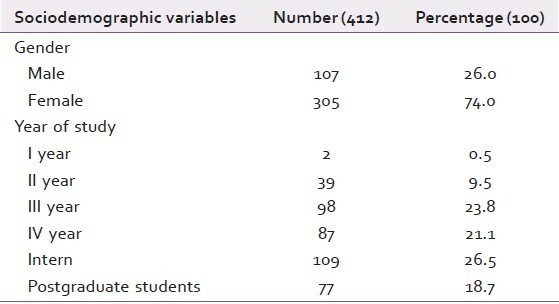 Hydrogen peroxide was the most commonly used storage medium of extracted teeth preferred by the students (42.2%), followed by Formalin (37.9%). About 35.4% of the subjects considered Formalin to be nonhazardous for storage/disinfection of extracted teeth, and 37.9% were not sure. Merely 26.7% of the subjects considered formalin to be hazardous. Only 15.0% responded that they had observed hazards due to the use of chemicals for storage and disinfection of extracted teeth. Most of the subjects (81.3%) had not referred any published scientific literature regarding the use of an appropriate medium for storage/disinfection of extracted human teeth. Most of the subjects (75%) preferred to use extracted teeth as against typhodont teeth (25%) to learn dental preclinical skills. Change in surface characteristics of the extracted teeth was noted by 42.7% of the subjects, whereas 57.3% did not notice any change. For the question regarding disposal of extracted teeth after use, the responses were 40.0% for dustbins, followed by red color coded disposal bags (27.2%) and yellow color coded disposal bags (24.5%). 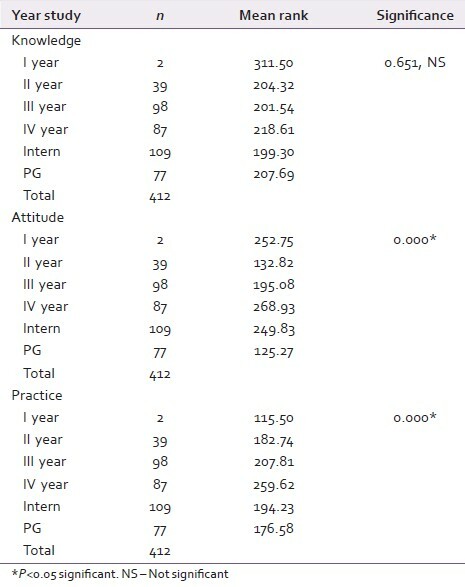 The total mean knowledge, attitude and practice scores for the study participants have been presented in [Table 3]. Comparison of mean knowledge, attitude and practice scores between genders using Mann-Whitney U-test has been presented in [Table 4]. The mean ranks for knowledge scores of male participants were better, whereas mean ranks for attitude and practice scores of females were better. The difference in mean knowledge, attitude and practice scores across genders were not significant. 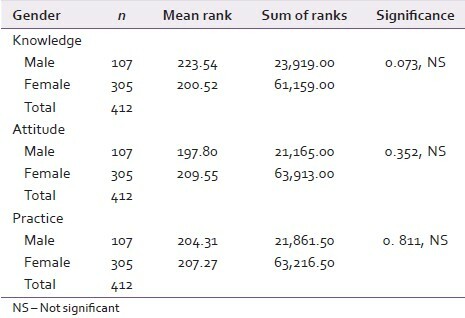 Comparison of mean knowledge, attitude and practice scores across year of study using Kruskal-Wallis test has been presented in [Table 5]. The difference in mean knowledge scores across year of study was not significant, whereas the differences in the mean attitude and practice scores across year of study were statistically significant (P < 0.05). Many studies have been carried out to assess the disinfection/sterilization of extracted teeth ,,,,, but the knowledge, attitude and practices of students who use them most commonly have not been assessed frequently. The present study is an attempt to gain information from the students regarding handling of extracted teeth, so that adequate precautions could be advised to them. Though 74.5% of the students considered extracted human teeth to be a source of infection, 80.6% of the subjects in the present study were not aware of guidelines by regulatory bodies regarding handling them. Further 84.7% felt the need for guidelines by regulatory bodies/institutions to handle extracted human teeth. This point emphasizes the need that cross infection control and sterilization measures which are taught from the beginning in the dental curriculum, also needs to include guidelines on handling extracted human teeth. Preclinical exercises on extracted teeth are taught during the first 3 years of the dental curriculum and further they are used by students to master their skills by practice. Majority of the students (>90%) said that extracted teeth need to be sterilized before use, and mouth mask was necessary while working on them. Most of the students used the extracted teeth for the department of Conservative and Endodontics as they learn a lot of preclinical exercises including root canal treatment (RCT) in that department. No other alternative can better substitute extracted teeth. Moreover they are economical compared to typhodont teeth. Dental institutions/hospitals were the most common choice for procuring extracted teeth. But still half of the subjects obtained extracted teeth from private practitioners. Majority of the students preserved extracted teeth in some form before use and the period ranged from few days, 2 weeks to 2 years in some instances. The most common time period mentioned was for 30 days. It was surprising to note that though formalin is a proven disinfectant of extracted teeth, it was not widely used by the students. ,, Most of them preferred hydrogen peroxide instead. Apart from formalin autoclaving for 30-40 min at 240°F and 15-20 psi, 5.25% sodium hypochlorite have demonstrated effective disinfection. ,, Chemicals like 5% microten, 5% deconex, 2% glutaraldehyde have been tried to disinfect extracted teeth, but the results were negative. In a study 5% virkon (buffered synergized acid peroxygen system containing a high percentage of surfactant) and Gigasept PA (100 g of gigasept ® PA contains: 3.0 g Hydrogen peroxide, corrosion inhibitors and stabilising agents. Activator: Acetylcaprolactam, Propanol-2, Excipients) proved effective against the laboratory model of disinfection and were carried forward to challenge freshly extracted human teeth. Gigasept PA was the only disinfectant that sterilized 100% of the tooth samples. Gigasept PA was considered to be a safer and effective alternative to formalin for the sterilization of extracted teeth destined for teaching purposes. Gigasept PA is a high level hospital disinfectant that's used on medical instruments and is not easily available. In spite of the evidence from numerous studies, students still used hydrogen peroxide, sodium hypochlorite, normal saline etc., because of their easy availability in the dental college. Striking a balance between the effectiveness and hazards, house hold Vinegar (acetic acid) can be used for storage and disinfection of extracted teeth. In spite of being in a dental college 81.3% of the subjects had not referred any published scientific literature regarding the use of an appropriate medium for storage/disinfection of extracted human teeth. Extracted human teeth were preferred by 75% of the students as against typhodont teeth. While most of the preclinical procedures like cavity cutting, crown cutting, veneers, jacket crowns etc., can be easily practiced on the typhodont teeth, procedures like RCT do require extracted teeth for teaching purposes. Procuring extracted human teeth from various sources may be tedious, but typhodont teeth much more expensive. Typhodont teeth do not have the risk of cross infection, but the feel of the natural tooth is better felt in the extracted teeth. While there is no need to use coolant when using typhodont teeth, it's a must while working on extracted teeth. Since both the samples have their own pros and cons the students almost equally preferred to use them both. Change in surface characteristics of the extracted teeth were noted by 42.7% in the form of brittleness and change in colour. Many of the students were not aware of the right method of disposal of extracted teeth after usage, since 40.0% opted for the option-dust bins. Only 24.5% answered correctly that these teeth be disposed in yellow color coded disposal bags. Work surfaces and instruments should be cleaned and decontaminated with a suitable liquid sterilizer after completion of work activities. Kumar M, Sequeira PS, Peter S, Bhat GK. Sterilisation of extracted human teeth for educational use. Indian J Med Microbiol 2005;23:256-8. Nikita VL, Vidya BS, Sham SB. Disinfection methods of extracted human teeth. J Oral Health Community Dent 2007;1:27-9. Dominici JT, Eleazer PD, Clark SJ, Staat RH, Scheetz JP. Disinfection/sterilization of extracted teeth for dental student use. J Dent Educ 2001;65:1278-80. Handling Extracted Teeth. Available from: http://www.ada.org/sections/professionalResources/pdfs/cdc_handling_extracted.pdf. [Last accessed on 2014 Jul 24]. Lee JJ, Nettey-Marbell A, Cook A Jr, Pimenta LA, Leonard R, Ritter AV. Using extracted teeth for research: The effect of storage medium and sterilization on dentin bond strengths. J Am Dent Assoc 2007;138:1599-603. DeWald JP. The use of extracted teeth for in vitro bonding studies: A review of infection control considerations. Dent Mater 1997;13:74-81. Viana PS, Machado AL, Giampaolo ET, Pavarina AC, Vergani CE. Disinfection of bovine enamel by microwave irradiation: Effect on the surface microhardness and demineralization/remineralization processes. Caries Res 2010;44:349-57. Chandki R, Maru R, Gunwal M, Garg A, Mishra A. A comparison of different methods for disinfection or sterilization of extracted human teeth to be used for dental education purposes. World J Dent 2013;4:29-31. Cuny E, Carpenter WM. Extracted teeth: Decontamination, disposal and use. J Calif Dent Assoc 1997;25:801-4. Sandhua SV, Tiwari R, Bhullar RK, Bansal H, Bhandari R, Kakkar T, et al. Sterilization of extracted human teeth: A comparative analysis. J Oral Biol Craniofac Res 2012;2:170-5. Hope CK, Griffiths DA, Prior DM. Finding an alternative to formalin for sterilization of extracted teeth for teaching purposes. J Dent Educ 2013;77:68-71. Tabrizizadeh M, Abrisham M, Marvasti FD. Comparison of different techniques for disinfection of teeth internal space in preclinical teaching. J Dent Med 2009;22:120-4. CDC. Guidelines for infection control in dental health-care settings e 2003. MMWR Morb Mortal Wkly Rep 2003;52:1-61. Available from: http://www.cdc.gov/mmwr/preview/mmwrhtml/rr5217a1.htm. [Last accessed on 2014 Jul 24]. Schulein TM. Infection control for extracted teeth in the teaching laboratory. J Dent Educ 1994;58:411-3. Pantera EA Jr, Schuster GS. Sterilization of extracted human teeth. J Dent Educ 1990;54:283-5. Tate WH, White RR. Disinfection of human teeth for educational purposes. J Dent Educ 1991;55:583-5. White RR, Hays GL. Failure of ethylene oxide to sterilize extracted human teeth. Dent Mater 1995;11:231-3. Brauer DS, Saeki K, Hilton JF, Marshall GW, Marshall SJ. Effect of sterilization by gamma radiation on nano-mechanical properties of teeth. Dent Mater 2008;24:1137-40. Tijare M, Smitha D, Kasetty S, Kallianpur S, Gupta S, Amith H. Vinegar as a disinfectant of extracted human teeth for dental educational use. J Oral Maxillofac Pathol 2014;18:14-8. Ghosh A, Chowdhury S. Sterilization and disinfection of extracted human teeth for institutional use. Int J Clin Dent Sci 2013;4:9-12.